What is the Conventional Oil and Filter Change Service All About? Your Nissan should be serviced for an oil change every 3,000 to 5,000 miles. These are necessary to keep your engine properly operating and prevent the build-up of sludge. One of the most common maintenances required, it is essential to the health of your Nissan that you maintain this service. During a conventional oil and filter change service, certified technicians will remove the old oil and filter from your engine that has been collecting particles and replace them with fresh oil and a new filter for the approaching mileage. Oil changes are important to the health of your engine. The oil keeps the engine cool and clean, preventing the build-up and overheating. Like brake fluid and coolant fluid in your Nissan, oil breaks down over time as it collects dust and dirt, and its ability to protect the engine will decline. Maintaining these changes regularly will maintain the quality performance of your Nissan's engine. If you choose to not have your oil and filter changed during the recommended mileage of your Nissan, the performance of your engine will decline. As the oil continues to break down, it is unable to continue collecting particles out of the engine, and those that it has collected flow back through the system, being reintroduced without being stopped. This causes build-up and corrosion within the engine, threatening its performance and longevity. For longer periods without oil changes, much of the oil will be burned up through the engine, forcing the engine to operate without proper lubrication. This can cause the engine to overheat and crack, demanding repairs or replacements. 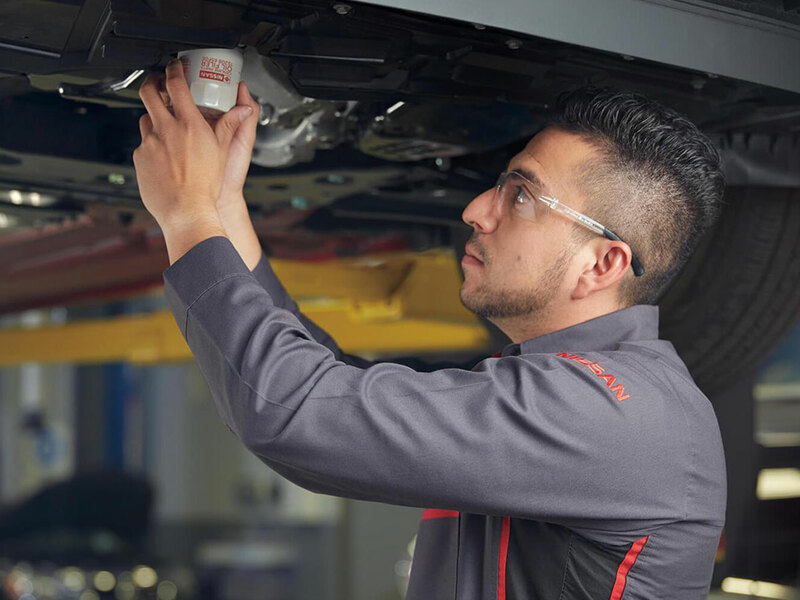 The service department at Nissan of Tustin understands the importance of an oil change and how it is central to the health of your vehicle. With a shop of certified technicians and quality parts, we are ready to service your needs. If you live in the Tustin CA, Irvine CA, or Santa Ana CA areas, contact our service department today to schedule your next oil change for your Nissan. We offer an express service option for our customers so that you can get on with your day shortly after bringing in your Nissan, and use only quality oil and Nissan oil filters for your service.